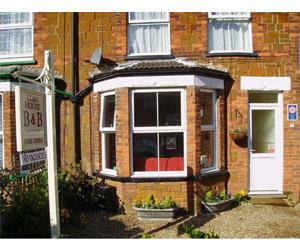 A Victorian Carrstone house situated 50 yards form High Street and 2 minutes from the town's beaches, promenade, theatre and cliff top gardens. We have 1 twin/super king and 2 double rooms all comfortably furnished with all the little extras that make the difference. We provide a wonderful English breakfast, using local produce and homemade bread. We can also provide a homemade 3 course evening meal in our cosy dining room on request. Maria and Stuart's aim is to make your stay as comfortable and relaxing as we can. Take A149 coast road signposted Cromer. At King's Lynn take Hunstanton exit A149. At mini roundabout at top of the hill take Old Hunstanton Road 2nd exit. After 1/2 mile take a left into Westgate and 2nd right into Church Street. From King's Lynn station walk across to bus station and get bus for Hunstanton. Alight at bus station and walk uphill keeping small green on your left. Turn left into Church Street by Jackson Shoe Shop.